The geography of the Middle East, much of which is in turmoil of one kind or another. The conflict between Israel and the Islamist movement Hamas in the Gaza Strip cooled off with an announcement of a truce. 166 Palestinians and six Israelis died in the 8 days, and both sides claimed victory of sorts. As one report describes the aftermath, "Israel said it reached its objectives, while Hamas claimed victory because Israel didn't make good on threats to send ground troops into the territory, as it had done four years earlier. Israel's air force carried out some 1,500 strikes on Hamas-linked targets, while Gaza militants fired roughly the same number of rockets, including some targeting the Israeli heartland cities of Tel Aviv and Jerusalem for the first time." The report continues, "The truce is to lead to a new border deal for Gaza, with Egypt hosting indirect talks between Israel and Hamas. Israel has shunned Hamas as a terrorist group and refuses to negotiate with it directly. Israeli demands that Hamas halt weapons smuggling into Gaza, while Hamas seeks free movement for people and goods in and out of Gaza." Sometime soon, Palestinian fishermen will be able to go out to sea six miles instead of three (Israel watches the sea and fishing vessels closely to prevent arms being smuggled into the Gaza Strip). Farmers will soon be able to plant and reap closer to the border with Israel, utilizing some of the 300-meter wide security strip once imposed on by Israel. Israel, for its part, pounded Hamas infrastructure, and has the opportunity to draw up more agreements regarding the sealing and interdiction of smuggling tunnels rife along the Egyptian/Gaza border. One of Israel's top objectives is to cut out weapons smuggling from Egypt to the Gaza strip. Many of the airstrikes during the 8-day conflict targeted tunnels such as these. The details of a new border deal at the same time brings Egypt back into the spotlight. Since Israel considers Hamas a terrorist organization, it will not deal with Hamas directly. Egypt plays the 3rd party communicator with Israel on Hamas's behalf, but has new challenges of its own. One day after the truce announcement, Egypt's new President, Mohammed Morsi, raised domestic and international concern with his own announcement. As a Washington Post article describes, "Egyptian President Mohamed Morsi took extensive new powers for himself Thursday, freeing his decisions from judicial review and ordering retrials for former top officials, including ex-president Hosni Mubarak. The decree, issued a day after Morsi won international praise for fostering a cease-fire in Gaza, appears to leave few if any checks on his power. The president said all of the decisions he has made since he took office in June — and until a new constitution is adopted and a parliament elected — were final and not subject to appeal or review. The announcement, read on state television by Morsi’s spokesman and broadcast repeatedly with accompanying nationalistic songs, shocked many in this struggling country, and street protests quickly erupted." A BBC article analyzes the move this way, "The president said he was acting to protect the revolution. Specifically, he wanted to prevent the courts from disbanding, for a second time, the assembly that is writing the Egyptian constitution. There were reports that the courts might be about to do this. That could seriously derail the transition to democracy, further delaying new parliamentary elections, which could deter Egypt's political leaders from taking tough decisions while they wait for the vote. ... They were not direct political appointments, but many Egyptians suspect they are still loyal to the old regime. The same applies to the prosecutor-general, whom the president sacked. His replacement moved quickly to re-open criminal investigations into the former president, his family, and former regime officials. On both of these issues, President Mursi will have the support of many Egyptians. But it is the way he has gone about it that has aroused such fury. 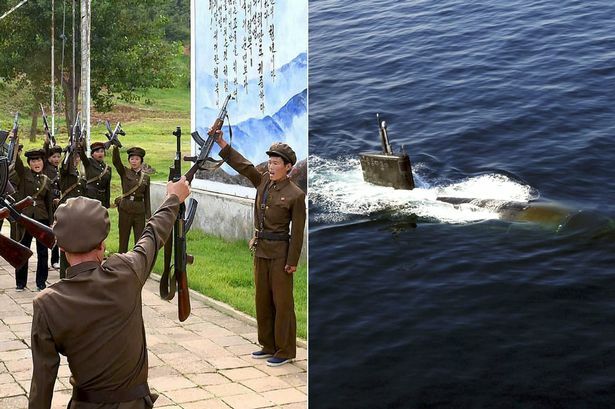 The president failed to consult with other political forces, acting in an autocratic manner reminiscent of his predecessor. Indeed, he has taken more power than Hosni Mubarak ever claimed, with almost no constraints at all. And his attempt to sideline the judiciary is reminiscent of the early power-grab of the Free Officers in 1954, the beginning of what is now being seen as six decades of military dictatorship in Egypt. As a result, many Egyptians fear the real agenda is not to protect the revolution, but to increase the power of President Mursi, and of the Muslim Brotherhood, the Islamist movement from which he comes. In particular, there is an accusation that the underlying aim is to enable the constitutional assembly - currently dominated by Islamists - to write an Islamist constitution for Egypt. 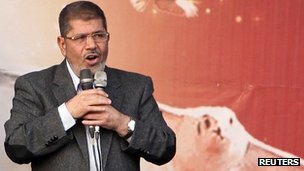 That is why President Mursi's move has produced such bitter, and potentially dangerous, divisions in the country." So here we find ourselves, watching to see where "Arab Spring" will take this major Arab power. Perhaps the most provocative words came from Nobel peace prize winner and former U.N. atomic energy agency chief Mohamed El Baradei. He lashed out at the declaration, which effectively puts the president above judicial oversight. "Morsi today usurped all state powers and appointed himself Egypt's new pharaoh. A major blow to the revolution that could have dire consequences..."
ElBaradei with his 2005 Nobel Peace Prize is an Egyptian that was recently hoping to lead Egypt himself as part of a secular pro-democracy party. 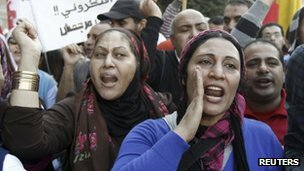 Interesting New Yorker article on female protesters in Egypt.